The Last Poets, a group of musicians and poet performers, originated out of the civil rights movement, with an emphasis on the black re-awakening. The original Last Poets were founded on Malcolm X’s birthday, May 19, 1968 at the former Mount Morris Park (Now Marcus Garvey Park), at 124th Street and Fifth Avenue in East Harlem, New York City. The original members, Felipe Luciano, Gylan Kain, and David Nelson took the name from a poem by South African poet Keorapetse Kgositsile, who believed that he was in the last era of poetry before guns would take over. They brought together music and spoken word. 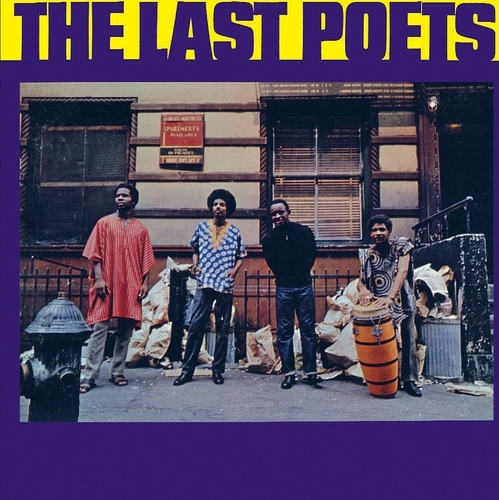 The Original Last Poets would soon be overshadowed however by a group of the same name that spawned from a 1969 Harlem writer’s workshop called “East Wind.” Jalal Mansur Nuriddin, Umar Bin Hassan, Abiodun Oyewole, and percusionist Nilaja are considered the core members of this group. In 1970 this group appeared on their self titled album. The Original Last Poets garnered some attention for their soundtrack to the 1971 film “Right On!” Following their debut album which made the top-ten lists, The Last Poets released The Last Poets (1970) and This is Madness (1971). Due to their politically charged lyrics both groups were targeted by COINTELPRO, Richard Nixon’s counter intelligence program along with other politically active organizations such as the Black Panthers. Though the popularity of both groups declined by the late 1970s, the respect the rappers and lyricists of the post-1980s era have paid them has helped cement The Last Poets’ place in history as a major influence on the hip-hop and spoken word movements. The Last Poets influenced jazz and hip hop artists ranging from Pharaoh Sanders and Senegalese drummer Aiyb Dieng to Public Enemy. Recently various members of the two groups have attempted to bring them together. The Last Poets have also collaborated with contemporary artists such as Common and Wu-Tang Clan.